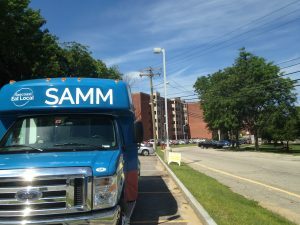 The SAMM Van is coming to a community near you! For regular updates and photos, follow us on instagram @sammvan. For a listing of our stops and information on shopping SAMM, see below. More detailed information about the mission of the SAMM project can be found on our SAMM Program Page. To learn about volunteer openings with SAMM, please contact Celeste Gingras at [email protected] or view our blog announcement. 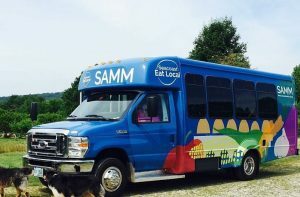 SAMM starts operating for the 2018 Summer Season on June 18! What Can I Purchase with SAMM? There will be a variety of foods available at SAMM stops, depending on what is locally available with the season. Shoppers can expect greens, vegetables (squash, corn in season, cucumbers, tomatoes etc) and fruits as they become available from local farms. SAMM will also stock dairy products, baked goods and meats as they are available. The rotation of items is likely to change weekly, so the best way to know what SAMM is stocking on any given day is follow us on instagram @SAMMVan. SNAP/EBT customers are welcome and encouraged to take advantage of SAMM stops in their neighborhood. SAMM will be accepting both cash and food benefits associated with SNAP for all EBT eligible purchases. Staff will always be available and willing to help SNAP customers learn about using their benefits. SNAP customers who have received tokens or fruit and vegetable coupons at one of our participating stationary markets will be able to use those same currencies on SAMM. While SAMM will always accept tokens and fruit and vegetable coupons that SNAP customers already have, SNAP customers coming to SAMM to shop will not receive those physical tokens and coupons as they have become accustomed to. Instead, SNAP customers will receive an automatic discount when they check out with their purchases. 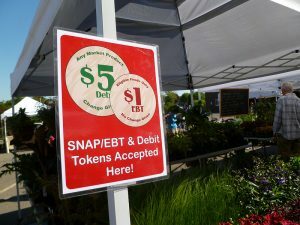 SNAP customers will receive a dollar-for-dollar match to be applied to their current purchases of fruits and vegetables. As with our participating stationary markets, SAMM accepts both debit and credit purchases with a small fee. The charge for a debit purchase is $1, the charge for credit is $3. These nominal charges cover the bank fees associated with operating debit/credit services so that we do not have to pass these fees on to farmers. How Do I Get SAMM in my Neighborhood, or at my Business? A lot of thought, planning and effort goes into each SAMM community stop site. There are many factors that affect whether and when SAMM makes a particular stop. 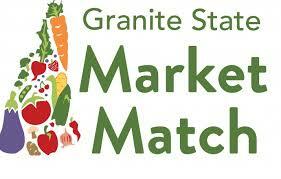 Among them are the population density and foot traffic, the availability of locally grown foods and farmers’ markets, access to public transportation, local licensing laws and local desire and support for SAMM services. If you are interested in seeing SAMM make a community stop in your neighborhood, please be in touch with our SAMM Program Coordinator, Celeste Gingras at [email protected] or with our Director of Programs, Jillian Hall, at [email protected]ocal.org. Businesses may also contract with SAMM as an employee benefit. Many health plans offered by insurers will provide funds to support a SAMM stop and Seacoast Eat Local is glad to provide supportive education services to help employees make the best of this benefit. Typically, employers looking to contract with SAMM should have a minimum employee population of 100-150 workers. Employers may share a stop with an adjacent business(es) to meet this threshold. 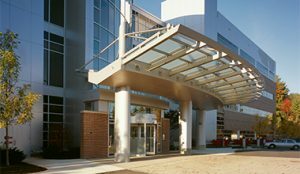 SAMM is generously supported by the Harvard Pilgrim Health Care Foundation and the New Hampshire Charitable Foundation.